Reset service light indicator Mercedes Viano. How to reset maintenance light, reset oil service light. Can be made manually by use button on car dash board. How to reset service light indicator Mercedes Viano W639 (646.980) 111 CDI. From year: 2007. With help by our visitor Brett, we added these steps. Brett was able to reset service light indicator Mercedes Viano 2.2 from year 2007, following these steps, that he recommended us. Thank you Brett. Turn the ignition key to position 2. Press button (3) repeatedly until the miles / kilometre reading appears on the display. Press button (1) repeatedly until the service symbol is shown on the multifunction display. Press button (2) for 30 seconds until a beep is heard. Press button (1) until display show service. Press and hold for about 2 seconds button (2), until the display show complet service, v handover, service cancel. Press button (1) until display show messages, standard, quality 229, quality 228. Select one of the qualities, try standard. Press button (1), display show, confir reset service 3s. Press button (2) for about 3 seconds. Until the display asks if you want to reset the service interval. The menu item “Oil types” is shown. Press button (4) repeatedly to scroll through the list. Select the used oil specification. Press and hold button (3) for 3 seconds. On the display will appears “SERVICE CONFIRMED” . Only reset the indicator after changing the oil. Check the engine oil specification befor resetting the maintenance service. If the wrong oil specification is selected. Turn the ignition off and on. The display will now list the service(S) to be carried out. Select “FULL SERVICE BACK” from the menu with button (1). PRess and hold button (x) for 3 seconds. On the display will appear “SERVICE CONFIRMED”. Select “FULL SERVICE” from the menu with button (1). Proceed in the same way as a normal reset. That it is the full procedure how to reset service light indicator Mercedes Viano. If you like to reset any maintenance oil light after an oil change. Or reset check engine light, airbag light, inspection key or insp errors when maint reqd, for Mercedes-Benz cars. Or any warning light for service reminder which appears on the display. Write in the search box the car name for which you want to find information, and find how to reset other service reminders when by yourself. I have a 2007 Viano, and the instructions here did not quite work for me. Where you say press button (x) we found that it is actually button (3) what button did you mean by X ? 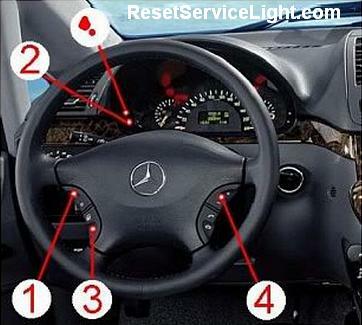 Thank you very much for your corrections on our article, how to reset service light indicator Mercedes Viano. You were right button x it was actually button 3, with your help we corrected this error. More than that, we were able to translate the movie sent by you. We added the correct steps how to reset service light indicator Mercedes Viano 2.2 from year 2007. Any ideas on how to reset the srs abs and esp lights on viano 2007? Hello! You might consider checking these errors at your dealer. They can be removed with a computer interface.